So I’ve been working. A Lot. After my 16th day in a row (needless to say, I haven’t been cooking at home), I decided I needed a little treat. Larkburger recently opened a few blocks from my house, and since it has a cult following in Boulder, I thought I’d check it out. Nothing draws me into a restaurant more than fresh local ingredients – and if they are served at a reasonable price and quickly, even better! I tried the Little Lark (I like a lower meat to bun ratio than most), some regular fries and a chocolate shake. I made the mistake of asking a new kitchen to cook me up a well done patty, when they recommend a medium. It was quite a bit more done than well – very dry. I think it was just a little overzealousness on the part of a new line cook, honestly. Everything else was good to excellent – I liked the lemon aioli that makes up their “special sauce”, the fries were good and the shake pretty snazzy too. 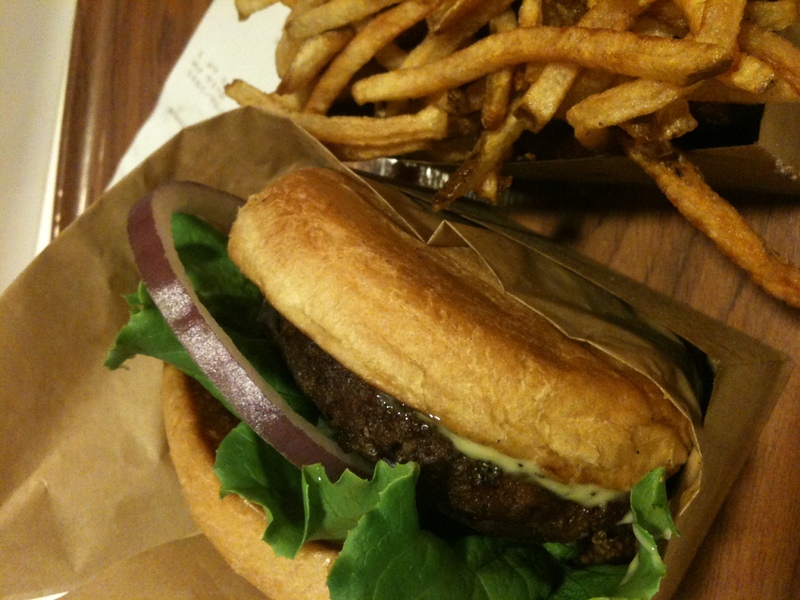 I almost got their Portabella burger – a whole portabella cap – since it sounded so good, but that will be for next time. Or maybe the Tuna burger and some Truffle Fries. I especially like that they have salads and Edamame to health it up and they serve beer. Overall, looking forward to having healthy fast food so close and looking forward to giving it another try once they’ve worked out the kinks! It IS a pleasure to meet you! I moved into a great neighborhood – especially since I am 2 blocks from this local gem! 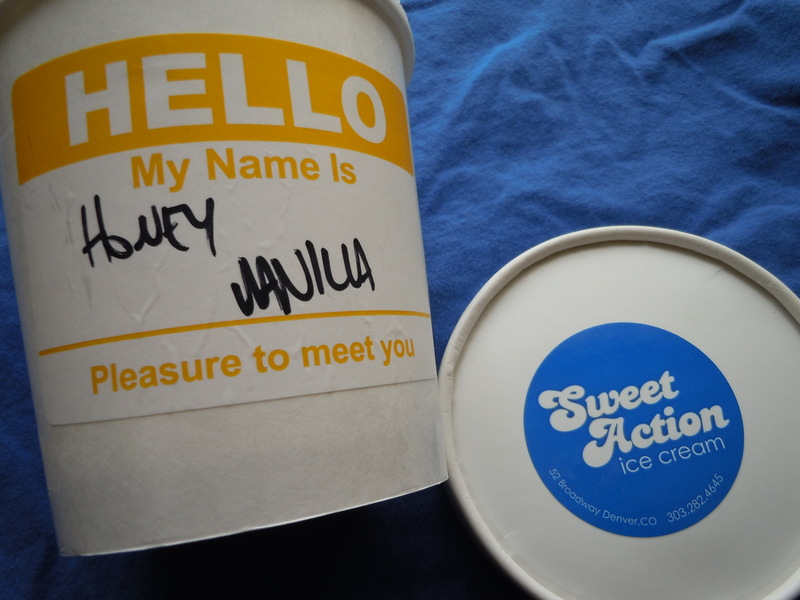 Ice cream is my favorite food, and Sweet Action makes some great flavors – especially their Salted Butterscotch (makes a great hot fudge sundae). This Honey Vanilla was really exceptional though. Vanilla is my all time favorite flavor, so it’s hard to wow me! Today’s flavors included Baklava, Molasses, Garam Masala, and Alpine Herbal Orange Swirl- they even offer several Vegan choices! Definitely get a homemade waffle cone. This is going to be a fantastic summer with these treats so close by! Spring is here – and with it a renewed dedication to blogging. Being without internet at home and needing a new camera really put a damper on one of my favorite activities…so glad I’m back in business! When the water comes to a simmer, dunk in the asparagus for a minute to reheat, then pull out with tongs and drain. If asparagus is raw, just let it cook for a few minutes, until barely tender. Crack one or two eggs into the gently simmering water. The fresher the egg, the better it will look and taste. Let simmer until whites are firm, but yolk is still squishy feeling. Pull out with a slotted spoon and drain on a paper towel. Place toast on a plate and either butter or drizzle with a good quality extra virgin olive oil. Stack on the asparagus, then top with the eggs. Season to taste with salt and pepper. Drizzle with more olive oil, if desired. 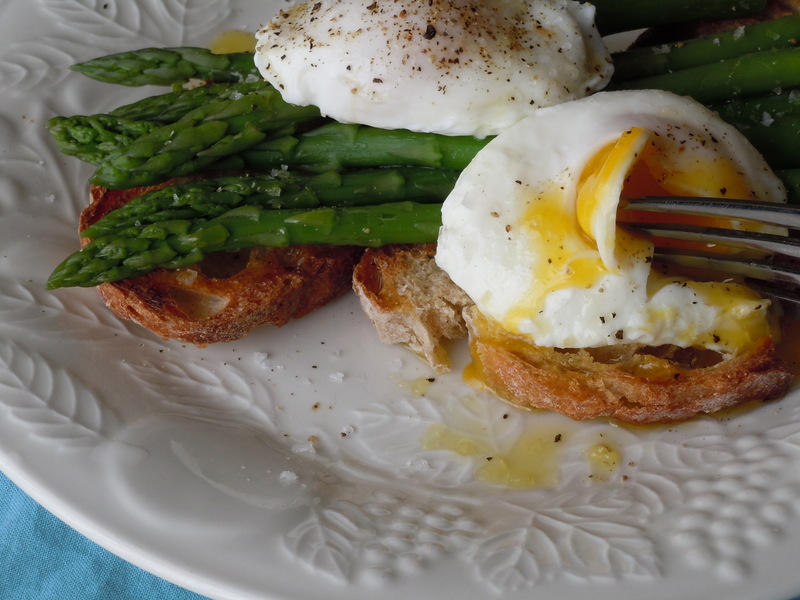 Break the yolks open so they flood the toast and asparagus. Enjoy! If poaching an egg intimidates you, fry one up over easy instead. Leftover roasted asparagus can be eaten this way, but you’ll have to saute it for a minute, or microwave instead. 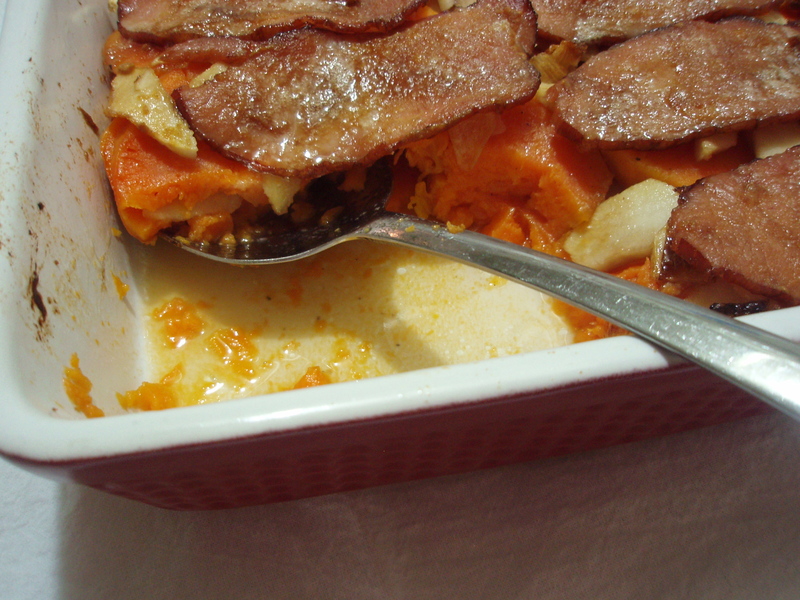 For all of you looking for a different sweeet potato recipe for Thanksgiving – this is a fantastic recipe! Sadly it is not my own…it is adapted from the fabulous The Bacon Cookbook by James Villas. I do love to make it, and it always gets rave reviews! Preferably, I use an uncured Canadian bacon- the bacon pictured above, while delicious, was thinly sliced – thicker would be better. As a main dish or side, you can’t go wrong with this one! I’ll let you in on a little secret. I didn’t really like pie growing up. It was the pie crust. Commercially made piecrust was, and still is, pretty disgusting to me – chemically tasting with a oily coating on the tongue. If my mom, or one of my aunts, made it from scratch I would eat the bottom crust and filling, sometimes the top crust – but never the thick edge – too gross! Luckily, my sister’s favorite part is the crust, so no crust of mine ever went to waste…she loves pie crusts so much, she will even eat the dough! Not really my cup of tea, but hey, we all like something weird. Once I got older and started making my own crusts, I came to love pie. But not just any pie, just good pie, and that is hard to find. Fillings come and go, but the secret to good pie is a good crust. Pie classes are the most requested topic for my classes, and with good reason. 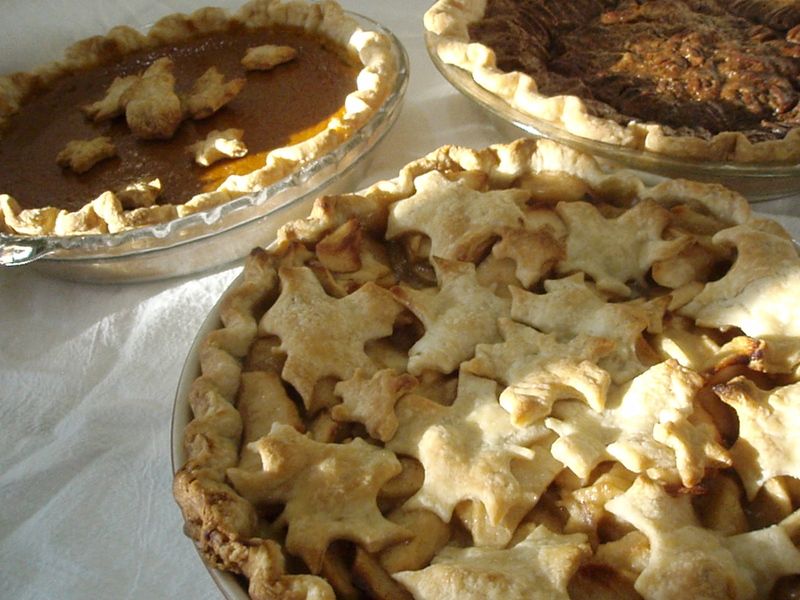 Pie crusts can be finicky- especially when made with butter. A shortening or lard crust are much easier to make. I don’t have a problem with lard – if it is real lard and non-hydrogenated (most lard you can find is commercially rendered and partially hydrogenated), it is actually surprisingly good for you. But only if you can find the real stuff. For me, I grew up with shortening crusts, and those are still my favorite – but only if the shortening is non-hydrogenated. (Beware, there are “trans fat free” versions, but they can still be hydrogenated, just look at the label.) My all-time favorite brand is Spectrum, followed by Whole Foods’ 365 brand. (and no, these brands don’t even know I exist, much less pay me for sponsorship!) Most larger grocery stores here carry one – you may just have to look in the “organic” grocery or baking section. The following recipe is my personal favorite pie recipe, adapted from an old Betty Crocker one – very easy to work with and extremely forgiving. The perfect crust to try if it is your first time making pie! In a medium bowl, mix flour and salt. Cut shortening into flour until the largest particles are the size of peas. Sprinkle with water 1 Tbs at a time, tossing with a fork until all flour is moistened and pastry almost cleans side of bowl. With heel of your hand, smear each portion once or twice in a forward motion to help distribute fat. Gather dough and form into 2 or 3 balls, then flatten each into a 5-inch disk. Cover any portion you are not working with to prevent it from drying out. *At this point, dough (tightly wrapped) can be refrigerated for up to 2 days, or frozen up to 3 months. If refrigerating, let sit at room temp for 5 minutes before rolling. Thaw frozen dough in the refrigerator overnight before using. Place dough on lightly floured surface and cover lightly with flour. With a floured rolling pin, roll pastry from the center out in north and south directions, turn pastry a quarter turn and repeat. If dough starts to stick, flour the surface a bit more, but try to use as little flour as possible. Roll the dough to about 2” larger all around than the pie pan you are using. Trim with a knife if necessary. Repair any tears by lightly moistening tear with cold water and pressing edges, overlapping, together. This recipe works well doubled. It is harvest time and soup season has begun! This year, my sister grew some Golden Bantam corn – an old heirloom variety that Burpee started selling in 1902. It was the first yellow “sweet corn” popularly grown – before Golden Bantam, yellow corn was used almost exclusively for animal feed. 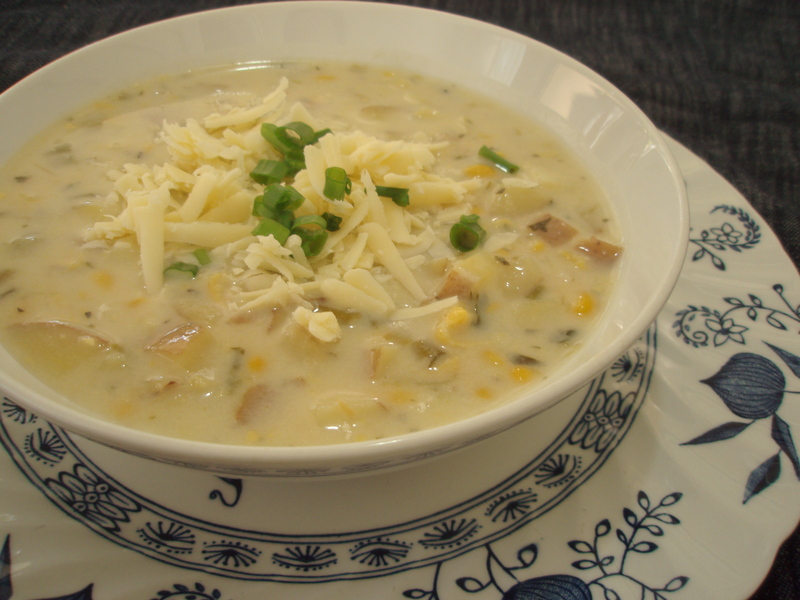 It is not as sweet and tender as today’s super-bred versions of corn, but it has a nice meaty texture and makes for a yummy chowder. I like my chowder a little thinner, so I use the smaller amount of butter and flour in the recipe, but if you like your chowder really thick, use the larger amounts. By using milk and thickening the soup with flour and not cream, the soup is a little healthier as well. Not heavy, but just rich enough, this vegetarian version of corn chowder is perfect for a cool fall day. Melt butter in a large pot. Add diced onions and celery and cook over medium heat 6-8 minutes, or until soft but not browned. Add flour, stir to combine completely and cook over medium heat for 1-2 minutes or until bubbly (to cook away the raw flour taste and make a roux for thickening the soup). After the roux (flour and butter mixture) has cooked, gradually whisk in the stock and stir until smooth (there will still be the chinks of onion and celery, but the liquid should be smooth). Add potatoes, corn, thyme, parsley and bay leaf. Season to taste. Bring to a simmer and cook until potatoes are tender 15-30 minutes, depending on the size and type of potato. Mixture should seem a little thicker than you’d like it, as adding the milk will thin it out. If the soup is too thin, raise the heat and boil uncovered until it reduces to the thickness you desire. Add milk until the preferred consistency is reached and check the seasoning. Gently heat soup up on medium heat until it reaches desired temperature. Serves 4 as a main course. Will last 4-5 days, refrigerated. If desired, garnish with shredded cheddar cheese and chopped green onions or parsley. Chicken Stock, ready to go! Fall has arrived, and with it big changes for me…I haven’t been posting since I haven’t been cooking much. A job promotion and two moves later, I am ready to get back to the stove. In honor of comforting fall and in preparation of soup season, I give you: Chicken Stock! My freezer always has a stash of vegetable and meat scraps for stock. Since you can pretty much use things to make stock that you would otherwise throw away, it is definitely much more cost effective (basically free!) to make your own and portion it into sizes that fit your needs than buying it from the grocery store. Much better tasting and healthy for you too! I either use plastic containers or mason jars for stock in the freezer – just remember liquids expand when frozen, so leave an inch or so at the top for expansion, otherwise you may break the container. 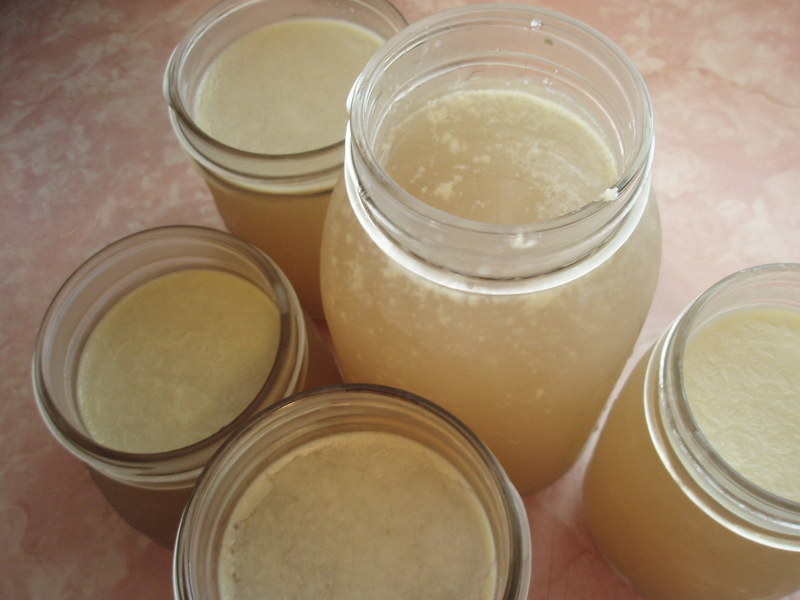 Chicken stock is a good universal stock – lots of nice flavor and not too rich. Don’t eat meat? Follow the directions below, omitting meat and cooking only for 30 minutes to 1 hour for a delicious vegetable stock. The goal of making your own stock is to create a flavorful liquid for cooking – an easy way to add flavor. No need to worry over it – think of it more as a thrifty way to use what you have on hand than a specific formula! Raw chicken pieces, raw bones or leftover bones from a roasted chicken may all be used for stock. To make an amount worth the effort, 2-3 carcasses should be used. Carcasses can be kept in the freezer until you have enough to make a batch. Giblets, gizzards, wingtips and hearts may be used, but DO NOT use the liver. Most vegetables do well in stock – just keep in mind that strong flavored ones may overpower the rest! Cabbage and other brassicas (broccoli, etc) do not take well to long cooking and make the stock taste a little funky. The only exception is turnip, a very little is ok. Potatoes will make the stock cloudy and bland. Beets will make the stock red and too earthy. Tomatoes should be used sparingly. A little onion skin will help the stock have nice color, but too much will make it bitter. 1-2 onion skins are enough. Strong herbs, such as rosemary, fennel or dill will limit the use of your stock. Fresh parsley and thyme are best. A few whole peppercorns add flavor without overwhelming the stock, but Do Not salt or finished dishes may end up too salty! To Make Stock: Place 2-6 chicken carcasses in a large stockpot with 1-2 pounds mixed vegetables (usually carrots, leek tops, sliced onion, celery), a couple peppercorns and a few sprigs of herbs. Cover with COLD water and a lid (the lid is to help keep your house from smelling like stock. If you have a good hood exhaust a lid is not necessary); bring to a boil over medium heat. Reduce heat and simmer 3-5 hours, skimming any foam off the top. Strain stock and either portion into 2-3 cup portions or place in a shallow pan to cool. (For food safety reasons, this stock must cool to 40F within 2 hours – small portions or a large shallow pan help with this – an ice bath for the pan can also help. Putting a large amount of stock to cool in the refrigerator will raise the temperature of the fridge too much, so the above methods are best ) If stock is not strong enough , replace stock in stockpot after straining and boil off the water until desired strength is reached. Once cooled, fat should have risen to the surface and created a solid mass. Skim this fat off before using so stock isn’t too greasy when hot. Stock keeps 4-5 days refrigerated, or 6 months frozen.